Is Elive good for laptops with an external monitor? I cannot have Elive appear on my external monitor after installation. It seems to recognize that there is an external monitor, for a textbox pops up asking if I want to improve my monitor environment (not the exact wording) by using the “next tool”. But, when the tools open (showing two boxes in the main window, which I suppose are the laptop monitor and the external monitor) I don’t really know what to do actually. I’m supposed to create a file and saving it somewhere, but I am not accomplishing what I really need: showing Elive on the external monitor and shutting down the laptop monitor when I close the lid. Is there any tutorial on how to proceed exactly? I’ve used this dialog two days ago at my Samsung NC10 (32bit Netbook, Graphic card: Intel GMA 950). Most monitor provide an EDID, with the supported and best resolution and framerate. cheaper monitor or TV screens sometimes providing wrong data, but most time to get a smaller resolution as supported, but not very often that it don’t work (it was a much bigger issue in the past, with some CRT monitor). Summary: Just click around in the dialog and read the text. It is not possible to break anything. In worst case the Your graphic card messing up with something, you can easily check this in ‘live mode’ while booting Elive from USB, without break anything on the installed-system. If something is broken, however, you should be familiar with the console/terminal. Thank you. I’ll have another look at this function. But, just for my information, does your laptop monitor switch off when you close the lid? The monitor switches black, yes. This is caused by a pin, that is triggered by closing the lid. But in the dialog (and xrandr) the laptop-screen is still listed. But, if i remember right, you can disable the screen in the dialog as well. This is also the word, that helps you to get more information via Google. In the large main Area, on the top left you should see 3 squares. Each Monitor can be moved. If both monitors are moved, there is a light square you couldn’t move. I think this is your actual screen. One of both should cover the light area. Now you can move what display should be left and what should be right. Or top and bottom. On each screen (here LVDS1 and VGA1) you can right click on the screen and change the resolution and orientation (90° for pivot, 180° for strange setups and 270° for strange pivots). You’ll get the resolutions the monitor is supporting from the EDID (hart-coded in the monitor itself). There are ways to override, but in most cases not needed, anymore. 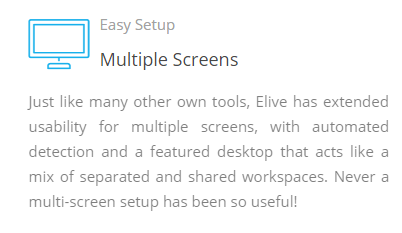 Than you are able to save the setup to store different setups for different situations. Or just click ‘Apply’ to activate the made changes. Many thanks LupusE, I am going to cherish this information until I’ll find some time to reinstall Elive in dual boot. I am using it on another PC under VB right now and it’s working well. Then, the next big thing will be installing all that is needed to type in Japanese. I hope there are some users in this forum that can help me with this. I already tried but failed miserably. I have to admit, I am not using e second screen on regular base. So I don’t noticed it will save the last state. If you using it the first time, it will have a ‘clone display’ setup. In most cases this is a good idea (beamer, presentation, POS, …) but if the resolution is very poor and the other is a 4k display, it will look awful on the 4k screen … With the above mentioned tweaks (drag and drop one monitor at the side and set the resolution with right mouse click) it is solved as fast as possible. I think the fist setup (cloning) and the ‘remember last state’ is the ideal configuration. No change needed from my side. 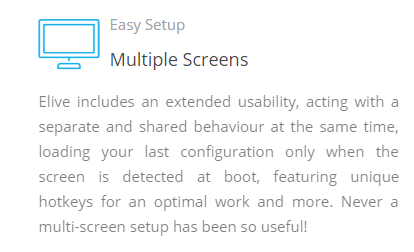 But I am really wondering how to set up my ‘main screen’. In other desktop environments/window manager I can choose the main screen and there the ‘menu bar’ will appear. Especial useful, if one screen is pivot and on the bottom isn’t much space.